You are here: Home 2014 July SCCM Configmgr 2012 Powershell script How to delete multiple packages applications Driver packages what else ? As Configmgr admin,we will be doing some maintenance cleanup activities monthly or quarterly for applications,packages,drivers ,collection etc.I will write another post on ,how to identify the packages which are not used from longer period by Configmgr clients. 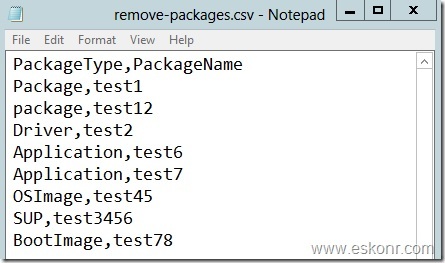 Removing single package from console is straight forward .Right click on package and click delete.This process takes few steps asking to go through the prompt to answer or delete directly. I have collected several packages with different package types like applications,driver packages,SUP packages etc using the SQL quires based on the usage and i decided to delete all of them. How do delete all ? Search each package where do they reside in console and delete one by one manually ? If you have no better job than this,then yes,you can of course go with manual method to identify where they reside in Console and delete it . Powershell gives so much flexible to perform most of the configmgr jobs with single command line. I wrote a powershell script-looks like very lengthy since the commands for package,application type,SUP,image are different and i have used several if conditions to check if the package really deleted from console or not not before it write the result to output file . This script basically take the information from the txt file , what you supplied and based on the package type (like switch case here),it will jump to the specific category and perform the deletion. What is required before you run the script ? 2. 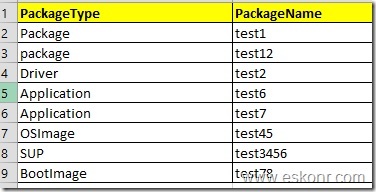 Get list of all package names (script is written based on its Name instead of Package ID) either from Console or SQL database along with its package Type. do some excel work to replace the space with comma(,) and save it . You don’t require Excel to be installed on the computer to run the script .Notepad is enough to read for Powershell. 8 Responses to "SCCM Configmgr 2012 Powershell script How to delete multiple packages applications Driver packages what else ?" Will this delete the package source files too? No, it won't delete package source files, just only package from console. Thank you for the response. Just would like to see if you have any suggestion for me. I am intending to delete the packages along with source files. You can extend the script to get the Content location path for the particular package before deleting the package from console and after the package is deleted from console ,delete the source files also. delete the source files that stored in first step. This was really helpful. Thanks again Eshwar. I´ve written a guide on how to clean up the Database within SCCM. I used your script as part of it. I also made a simple way of inputting the Data into the CSV via Notepad++ and some rregex usage.